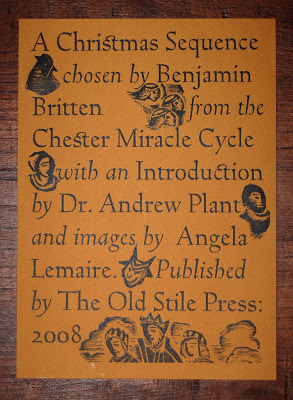 A couple of days ago I have finished my months of daily printing stints to complete this book. Today I am exhausted from feeding large sheets of heavy blue paper (to cover the binding boards) into the press so that I could print two large woodcuts . This was the very last thing to be done. Yesterday I had printed this large ‘Label” which goes on the front of the slipcase. And here you have sight of a regular domestic scene at The Old Stile Press! After my printing activities, the sheets have to be folded and half of these folds have to be inserted into another one to form an 8-page signature. 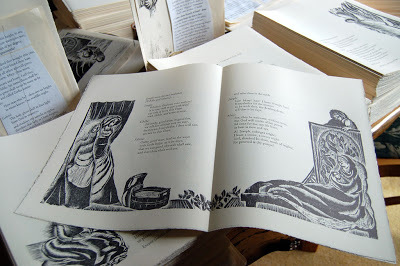 These have finally to be collated – to form the ‘inside’ of each copy. Frances does these tasks. For the final collating process, the stage is set as you see it here. 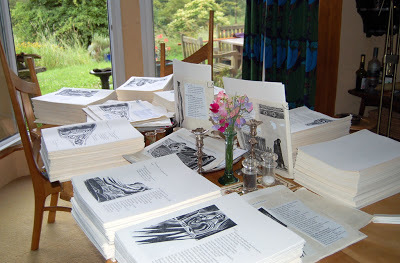 She walks round the table, picking a section from each pile (ten piles in this case) to make up a copy, each of which gets piled up in a box ready to go to be bound. It is a strangely beautiful sight but Frances declined to be photographed! I am sure I will not be able to resist adding to the blog photographs of the final work when the first copy comes from the binder. I love this picture – those pristine sheets on the table, the work nearly done for yet another beautiful book, the fresh greenery outside and you and Frances moving about the room in slow motion. A book-maker’s ballet? How about a video?